Irish Dip Sandwiches. It looks pretty darn good doesn’t it? Never heard of Irish Dip Sandwiches? Well, I imagine you’ve heard of French Dip sandwiches right? I can see the light bulb coming on over your head. I’m not sure what makes those sandwiches “French,” but the general make of the sandwich is well known. Beef, melted cheese, with a hot au jus (there’s the French! Whatever au jus means anyway :-/ ). Ok, I just looked it up, it means “of meat” so the sauce is derived from the meat as in the cooking juices/broth from the roast beef on the sandwich. Lesson noted, but while we’re learning here, what makes me think these are Irish Sandwiches? Corned beef is criticized as not being truly Irish. Fact is, when the Irish came to America they adapted the foods here to their traditions and created the boiled dinner of corned beef and root veggies. Technically then these should be Irish-American Dip Sandwiches. Let’s get back to these delish-looking Irish Dip Sandwiches, shall we? This recipe is an old favorite I’ve kept in my noggin for some time. It tends to resurface around St. Patrick’s Day, with years passing from the last time I made them. I tried to find the recipe online, knowing I must have learned it from somwhere. No matter how I searched I just couldn’t find anything resembling the sandwich from my memory. Could I have made it up? Surely something this rich in flavor and delicious should exist in a dream. There was no question now, Irish Dip Sandwiches were a blog to be. It is too good to keep to myself. I made them for dinner this past St Patrick’s Day. I tried looking the recipe up to verify my memory, but it is simple enough I didn’t need the nonexistent original anyway. Just a few ingredients, quick preparation, and these Irish Dip Sandwiches are ready to serve. My husband devoured his first in record time. For a second I wondered if he even tasted it when he declared his anger over why I had not made them years sooner. I guess he liked them. To be sure, he ate a few more to prove it. You’ve waited long enough. Here’s my recipe for Irish Dip Sandwiches. Preheat the oven to 350 degrees. Add the beer to a medium sauce pot on the stove. Make sure to use a medium pot, a small one may overflow if your beer foams. Boil for a couple minutes to remove some of the alcohol content. Add the beef broth and simmer. Add pepper to taste. 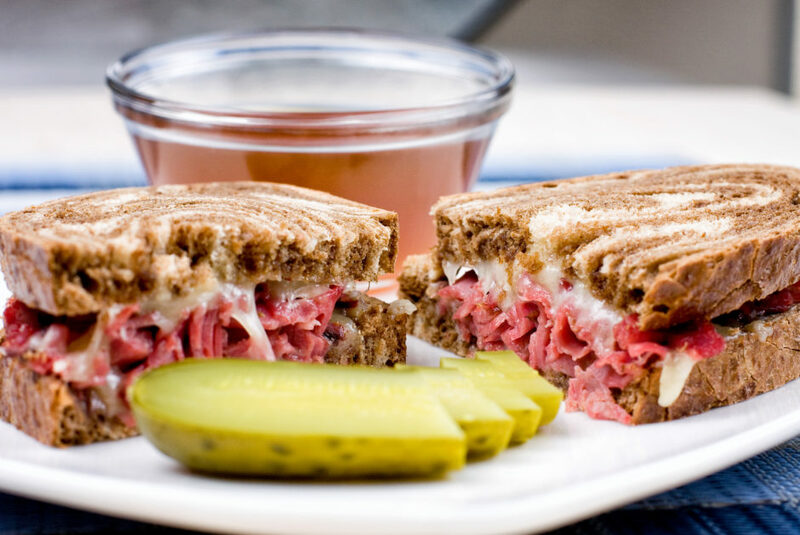 Chop the pastrami and corned beef and mix together. Lay out an even number of slices of marble rye bread. These will make the tops and bottoms of the sandwiches. On all slices sprinkle enough of the white cheddar to cover them all the way and to the edges. 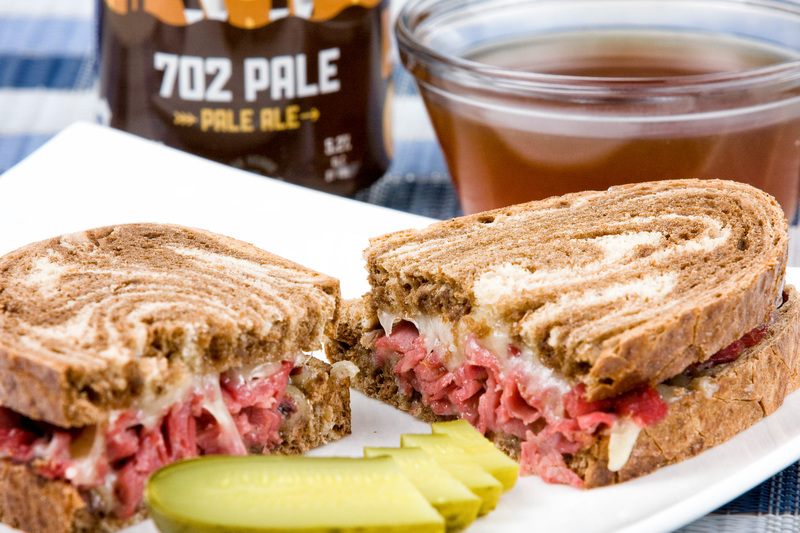 Pile the chopped corned beef and pastrami on half the slices. Sprinkle with more white cheddar. These are going to be the bottom part of the sandwich. Bake for about 7 minutes, or until the cheese is melted. Remove from oven. Add the tops to the bottoms of the sandwiches. Remove with a spatula. Cut in half. Fill a ramekin or small bowl with the beer-broth dip. These are great paired with chips, fries, pickles, or garlic potatoes as I do. Of course some would also say to pair with more beer to wash it all down. 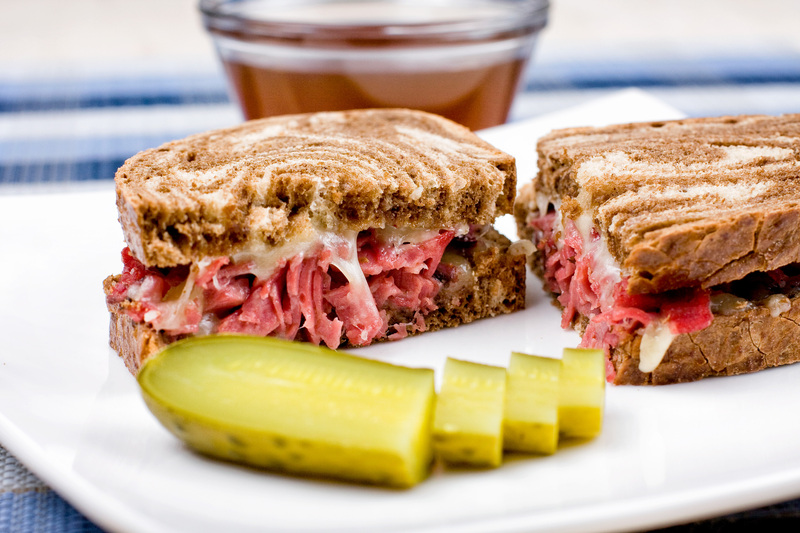 For more flavor and crunch add crispy onions to the sandwich before assembling. My husband ate them with and without the onions and approves of them both. The kids ate these Irish Dip Sandwiches without needing a single reminder to clean their plate. I will say I withheld the sauce from them because I’m not always confident the alcohol is totally gone when used in cooking. What do you think? For the beer content we used what we had on hand. There’s usually a variety of beers, but I’ve used pale ales mostly. I wonder what they would be like going full Irish and using Guinness. Maybe it will be an experiment for next time, which has to be soon according to my husband. If you’re looking for other simple dinner ideas, see my Super Simple Crockpot Recipe List for 10 more. Or one of my other favorites Delicious Pesto Chicken. If you’re looking for another sandwich idea try my Garlicky Grilled Cheese too. Please give these a try and post your review back here. These are truly delicious and easy.